Recognizing travel trends is vital to staying competitive and giving customers what they want. But no area has changed as much as the reservations area. It’s online and it’s increasingly mobile. 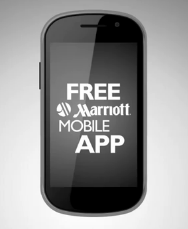 Marriott's new mobile app – designed for devices like iPhone, Android, and BlackBerry – is receiving great reviews. About 400,000 people have already downloaded it. Within days of being launched, it was ranked the fourth most popular free app on Apple’s iTunes and the most popular travel app. Marriott's e-Commerce team has created a hit! Unlike some other hotel companies that have one app per brand, Marriott’s app lets you search for more than 3,600 hotels among 13 brands in 71 countries. It also finds nearby hotels using GPS. When Marriott's first hotel, the Twin Bridges opened in 1957, families were just starting to drive long distances on Eisenhower’s Interstate Highway. It was a great system and really changed America. Twin Bridges Motor Hotel was located outside Washington, D.C. and it featured a drive-through front office. It made for quick and easy check-ins. Guests were able to be guided to their rooms by boys on bicycles and then able to park very close to their room – a real convenience, especially for large families. When they first opened hotels like Twin Bridges, no one envisioned making a reservation this way. It’s never been so easy. So, download the app that we linked below and leave a comment letting us know what you think. Oh, by the way, you can still book a room by calling a reservationist or by stopping by the front desk. Some things will never change.